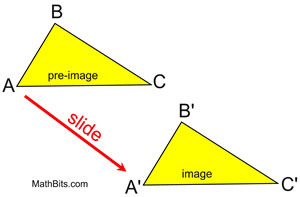 A translation moves ("slides") an object a fixed distance in a given direction without changing its size or shape, and without turning it or flipping it. • The original object is called the pre-image, and the translation is called the image. • The image is usually labeled using a prime symbol, such as A'B'C'. • Translations may be described by their movement, such as 5 units to the right and 2 units down. • An object and its translation have the same shape and size, and face in the same direction. • In Latin, the word "translate" means "carried across". (←) Translations can be seen in nature. 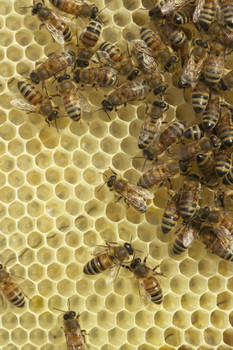 The hexagonal sections of a honeycomb are the same size, the same shape and face in the same direction. 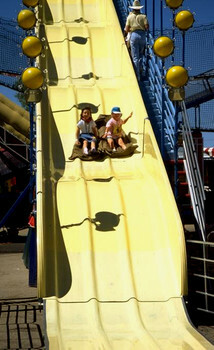 (→) As you go down a slide, you are undergoing a translation. You are moving a given distance in a given direction. You do not change your size, shape or the direction in which you are facing (hopefully!). Certain patterns of musical notes are often repeated (translated) within a composition. Seats in a stadium are the same size, the same shape, and face in the same direction. Notice how each vertex moves the same distance in the same direction. All three vertices (A, B and C) are moved 6 units horizontally to the right. If you move horizontally 6 units to the right, 6 is added to the x-coordinate of each of the vertices. Translation 6 units to the right. Be sure you notice where the original figure, ABCD, is located. 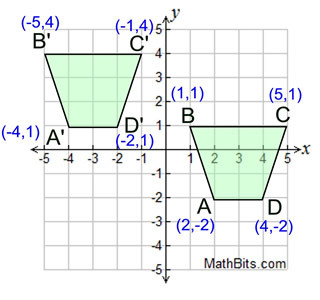 In this graph, ABCD is on the right. 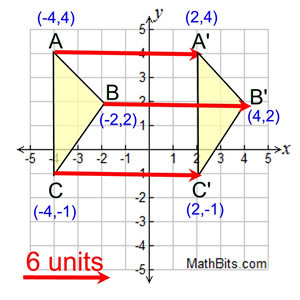 Each vertex of ABCD is moved 6 units to the left, and then 3 units up. Translation 6 units left and 3 units up.